Home › Electronics › Anker Premium Stereo Bluetooth 4.0 Speaker (A3143) 20W Output From Dual 10W D..
Anker Premium Stereo Bluetooth 4.0 Speaker (A3143) 20W Output From Dual 10W D.. Huge Stereo Sound: Enjoy crisp, clear audio with impressive volume powered by dual ten-watt drivers. Combined 20W output the highest available in this price range. 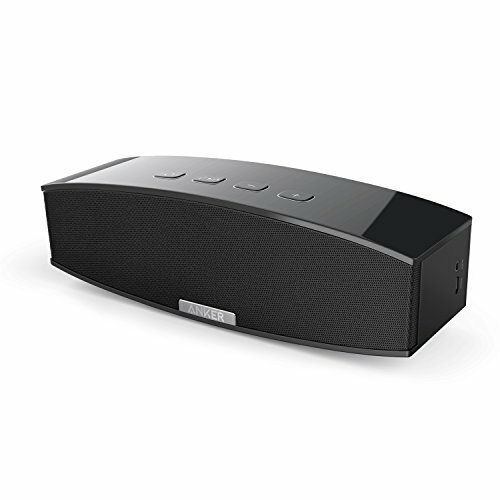 Color: Black Anker Premium Stereo Bluetooth Speaker More bass and volume for the music you love. Huge Stereo Sound Whether you're partying, working out, or just lounging around the house, enjoya full-range stereo sound with impressive volume. Booming Bass Powered by MaxxBass technology and dual passive subwoofers, to make sure younever miss out on those ultra low frequencies. Bluetooth 4.0 Connectivity Unlike other speakers, Anker uses advanced Bluetooth technology to maximizedevice compatibility and pairing speed. 8-Hour Playtime A 5200mAh lithium-ion battery lets you play up to 160 songs at mid-levelvolume on a single charge-that's pretty impressive for a speaker thispowerful. World Famous Warranty At Anker, we believe in our products. That's why we back them all with an18-month warranty and provide friendly, easy-to-reach support. Playtime varies according to volume level and audio content.